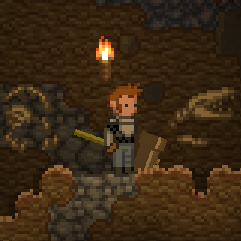 Fossils are found attached to the background in generic underground Layers (but not in underground Biomes) and salvaged using a fossil brush. 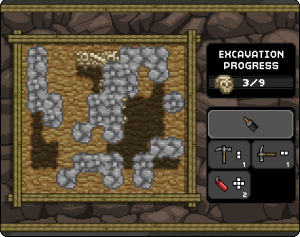 When activated with a brush a mini-game allows players to uncover the fossil hidden under layers of stone and dirt. Specialized fossil tools and display stands are crafted using a fossil crafting station. 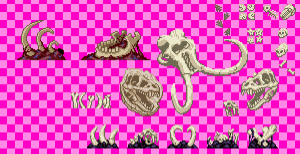 Note that the appearance of the fossil in the dirt may not match the actual fossil you get upon completing the minigame. The look of the fossil in the "wild" seems to be random. Fossils were announced as the second preorder stretch goal, rewarded when preorder sales passed $750,000. Fossils are the remains of long dead creatures scattered throughout Starbounds universe. They’re extremely valuable, very rare and very difficult to dig up. You’ll need special tools to clear the dirt and unearth a fossil. Removing the wrong piece of dirt could cause the fossil to crumble into dust. Successfully removed fossils can be placed as trophies, some have very special properties and perhaps some of these long dead creatures can even be revived. The tools required to find fossils are specialized brushes. First it was Hammers but they were replaced by Brushes. These are used on exposed fossils to trigger the mini game. Higher quality brushes make better tools available within the mini-game. Fossil brushes are crafted using a fossil station. Basic Fossil Brushes grant up to 8 power tools split between Dynamite and Hammers. Advanced Fossil Brushes grant Dynamite like a Basic Fossil Brush, but replace the hammers with double the hammer quantity of new tools, split evenly between Horizontal Mattocks and Vertical Mattocks. Master Fossil Brushes grant Hammers like a Basic Fossil Brush, but replace the dynamites with double the dynamite quantity of new tools. Half of this quantity is given in Chisels while the other half is split as evenly as possible between Left Drills and Right Drills, though in the case of an odd number of dynamites there will always be one more right drill than left drill. Using each tool will clear away sections of the excavation area. The brush can be used to remove dirt without being used up. The number of required tiles to clear away is displayed on the right hand side of the mini-game window. There are also treasure chests, which can be uncovered in addition to the fossil using the mini-game tools. If at any point the player cannot successfully clear, either because of destroying the fossil or not clearing enough rocks, the game will end and display a 'failed' or 'incomplete' message. Fossils are covered by both dirt and rock. The brush tool can be used to clear away dirt, but rock requires power tools with limited uses and specific shapes. If the power tools (non-brush) are used on any tile with a fossil without a rock layer in between, the fossil will be destroyed and the game automatically failed. Using a power tool on a dirt tile with a fossil beneath it will destroy the entire fossil. After clearing away the rock layer with a power tool or chisel, use the brush to uncover the fossil. Continue until the entire fossil is clear or all limited-use tools are used up. 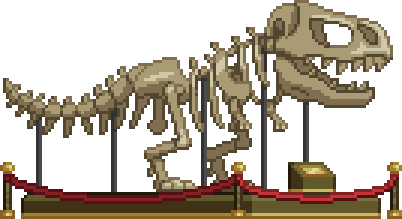 Successfully clearing the game will award a fossil, which can be placed on display inside display cases crafted at the fossil station. If a treasure chest was uncovered while playing the mini-game players will earn an additional reward. Chests which cover a 2x2 square give Treasure from the Fossil Bonus Treasure pool, but chests which cover a 3x3 square instead give treasure from the Fossil Rare Bonus Treasure pool. Fossil pieces can be placed in display cases. There are three sizes of display case available, small, medium and large. The fossil size is identified in the tooltip for each fossil piece. Interacting with placed display cases will open a container window. Placing fossil pieces inside will display them inside the corresponding case. Fossils can only be slotted into the case which matches their corresponding size. Completed fossils can be picked up and replaced like normal decorative objects without requiring re-assembly. For each complete fossil placed inside a display case players will fill an entry in their Collections Library. Each entry will show a picture and description after completion. For small fossils the entry will fill in after the piece is placed in a display. For medium and large fossils entries will fill in after all pieces have been assembled. Small Fossils fit into small fossil display cases. Each display case requires one fossil piece to be completed. Once completed the fossil will be displayed inside and the display case will be gated with a velvet rope. "Amber has more catalogued variations than any other ancient artefact." "Ammonites are widely recognised fossils, with variations appearing on most life-sustaining planets." "The egg of an ancient creature, frozen in time before it ever truly lived." "Fossilised fern leaves are evidence of organic life from millennia ago." "Little has changed about fish anatomy over the millennia." "A strange and curious life-form, now lost to time." "The fossilised remains of a Penguin." "Sabertooth are widely recognised fossils, easily identifiable by their elongated canine teeth." "The size of this footprint indicates it was probably made by an adult male of the species." "Triolbites are one of the more well preserved fossil groups thanks to their exoskeleton." Medium Fossils are of ancient humanoids, they fit into medium fossil display cases. Each display case requires three fossil pieces to be completed. Once completed the fossil will be displayed inside and the display case will be gated with a velvet rope. "The fossilised remains of an Apex. Note the powerful teeth and pronounced brow ridges." "Features of interest in this fossilised Avian are the hollow bones and the short flexible beak." "The plant based Floran have bones infused with lignin, giving a wood-like appearance." "A fossilised Glitch. The internal wiring is rarely preserved." "A fossilised human, the dominant species of Earth." 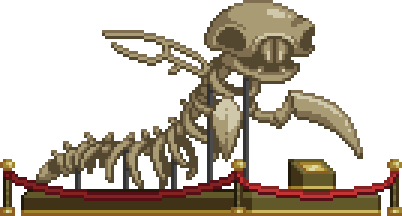 "This fossilised Hylotl skeleton shows early signs of adaptation to aquatic life." "The dense, hard bones of a long deceased Alpaca." "This Avioscale boasts oversized eye sockets and a prominent beak." "An excellent example of a fossilised Frogg." "A creature which has perplexed many scientists, its origin and age cannot be determined." Large Fossils are of ancient monsters, they fit into large fossil display cases. Each display case requires five fossil pieces to be completed. Once completed the fossil will be displayed inside and the display case will be gated with a velvet rope. "This arthropod's thick exoskeleton has helped it survive for millions of years." "This distant ancestor of the Snaunt used to hunt in oceans instead of on land." "A dinosaur once native to Earth, spread across the stars by overeager scientists." GeorgeV originally posted on the Official Forums with some of his ideas for how Fossils could be implemented in game. It appears he was responsible for the original propasals for fossils as a feature. 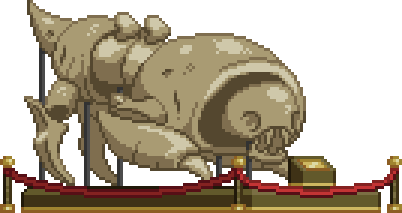 Fossils have been in many Starbound mocks we've shared. But sadly they've been pushed back to a non-priority. They would add so much character to worlds. They'd tie into a lot of systems. I drew the penguins and really love 'em. But gimmie fossils! Basically, theoretically (seriously this system is 0% built, just some art is done for it) you would use a tool to carefully extract fossils from the ground. There would be a lot of fossil types. Some really rare, others really common. They'd do a variety of things like add to the atmosphere, be used in crafting on all sorts of things like perhaps armor. They might help you obtain dna for a T-Rex pet. They might help you summon a boss. They could do a variety of things. All these are my ideas and I don't know if they'd stick (they're off the top of my head, these ideas are NOT confirmations of anything). We'd have to see what we could do. But I can't be the only one as a kid who dreamed about finding a T-Rex fossil in the ground! 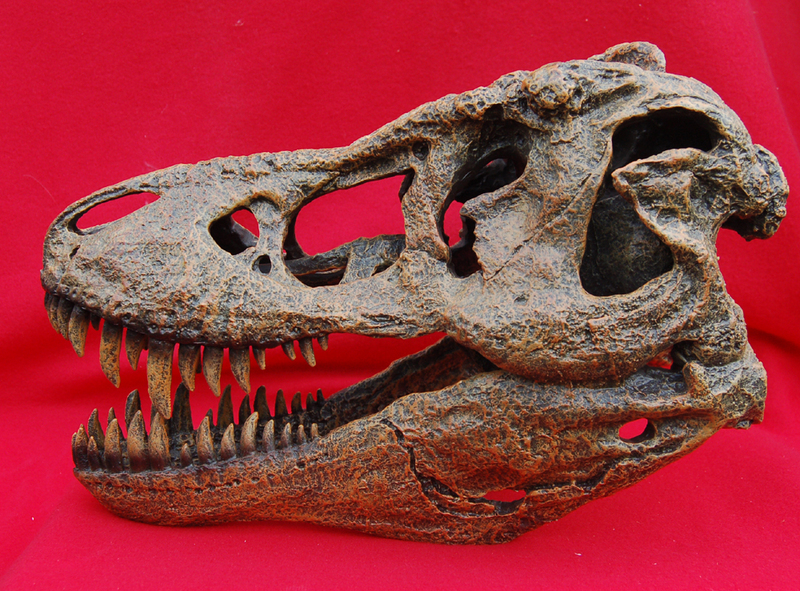 The T-rex skull only has three holes in it on either side; ears, eyes and nose. Technically, due to T. rex (and other dinosaurs) being diapsids it's supposed to have five on either side. See here. This page was last modified on 28 June 2017, at 17:11.